The Center for Puppetry Arts is quite an interesting organization. In addition to their famous museum with puppets from ancient days to now, they also have the whole Sesame Street crowd, including Big Bird, on display. If you bring youngsters they will be thrilled, and especially if you do their theatrical productions. Through the end of the year that famous red nosed reindeer will be bringing down the house. Adapted by Jon Ludwig from the famous film of the same name, the show directed by Tim Sweeney features a half a dozen top grade professional puppeteers and has some of the best projected graphics imaginable. And the music and singing is all live. 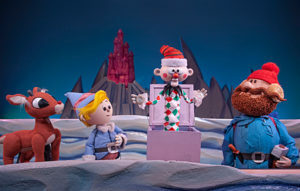 Rudolph felt rejected by others because of his nasal condition. He was only one of many toys that had been rejected and wound up on some strange island. But, fear not, for this young reindeer finds his way to be himself and be appreciated by others. It’s a good lesson for young folks, since it is akin to bullying. After the show, which runs about an hour and ten minutes, you can take the kids up to the crafts room where they will get free puppet kits and supplies and instructions and can create their own Snow Man hand puppet. They are playing to full houses, so make your reservations early. Plenty of free parking at their location on Spring Street.